Thousands of industry professionals attended the world’s largest helicopter exposition and tradeshow this year to see the latest and greatest in the industry, from small trainers to attack helicopters. 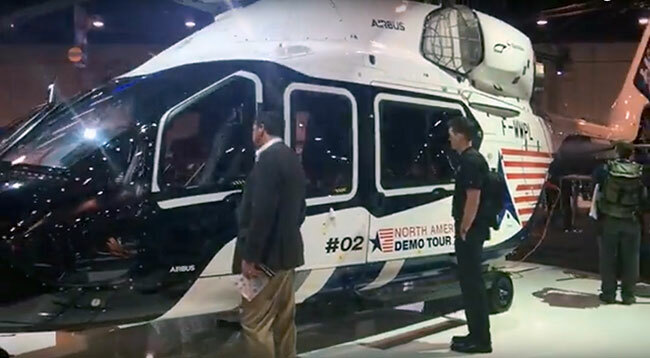 The HAI Heli-Expo 2018, held at the Las Vegas Convention Centre from Feb. 26 to March 1 featured, as always, a number of new helicopters and accessories, networking opportunities and professional education courses. Several companies, including Airbus and Waypoint, shared news and showed off prototypes at the show. Read on to find out more. The H160 prototype headlined Airbus Helicopters’ presence for the first time at an international airshow at the 2018 Heli-Expo. Maintenance demos on the H160 were performed daily to show how maintenance has been optimized and facilitated thanks to its unique design and new processes like the Operator Zero campaign. Alongside the second prototype of the H160 Airbus Helicopters displayed its HGeneration range of mission enablers including HCare services that allow customers to focus on their operations safely, efficiently and cost-effectively. On display was an H125 in a law enforcement configuration, the H135 equipped with Helionix, and the H145 in a private and business aviation configuration. In its on-going commitment to innovation and the future of flight, Airbus Helicopters is incorporating new digital and electrical technologies into products and services alike. An example of this is CityAirbus, Airbus’ self-piloted battery-powered aircraft designed with the latest safety standards to transport four passengers for inner-city flights. A mock-up of this project was showcased at Heli-Expo as the project team is maturing technologies that will allow a demonstrator to fly at the end of this year. 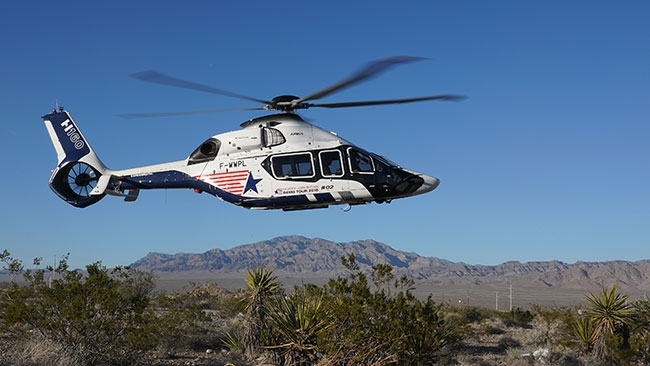 The H160 prototype landed in Las Vegas and headlined Airbus Helicopters’ presence at the Heli-Expo 2018. Waypoint Leasing and Italian airframer Leonardo Helicopters launched a new partnership at Heli-Expo 2018 involving the Waypoint medium utility helicopter (MUH), which made its debut at the show. On display at Leonardo’s Heli-Expo booth was the program prototype, a reconfiguration of one of Waypoint’s older, off-lease AW139 offshore transport helicopters. The work, performed by Eagle Copters over several months in Calgary, involved stripping out the medium-twin helicopter, removing superfluous equipment, and lightening it. Under the program, early vintage “short nose” offshore and VIP transport versions can be converted to serve a wide range of utility mission areas, including firefighting, light EMS/SAR, mining, powerline support, cargo and utility transport and general aerial work. To support it, Leonardo has rolled out a program specific to the MUH. The AW139 has achieved more than two million flight hours and has proven itself capable of supporting a wide range of missions, according to Leonardo senior vice president of global sales, Emilio Dalmasso. He added that the cost-competitive program will include entry into service, as well as comprehensive training and dedicated power-by-the hour support plans. Waypoint and Leonardo plan to take the MUH on a demonstration tour.